A Petition, Stop Dropping Turkeys from Airplanes, is currently circulating on the Internet urging Yellville, Arkansas NOT to revive the annual "Turkey Drop" from an airplane. Here is some background on this event and on a formerly held "turkey trot/drop" in Collinsville, Alabama. 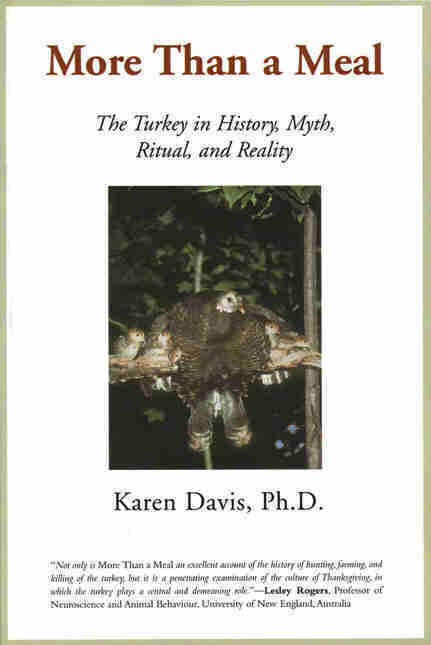 From Chapter 6, "Rituals of Spectacular Humiliation," More Than a Meal: The Turkey in History, Myth, Ritual, and Reality, by Karen Davis, PhD, President of United Poultry Concerns. In December of 1989, THE NATIONAL ENQUIRER did an exposé of a festival tradition in Yellville, Arkansas known as the turkey drop. That coverage, with its photographs of turkeys in mid-air being dropped from airplanes, put an end to the town's official sponsorship of the turkey drop. However, pictures speak louder than words only to an extent. Journalistic cues-attitude and interpretation-are crucial in determining how a mass audience will respond to graphic depictions of certain kinds of cruelty such as the turkey drop. In this instance, the Enquirer deplored the "nightmarish scenes" of turkeys being thrown from moving aircraft a thousand feet above the ground, plunging through the air at fifty miles an hour, crashing, and being chased down, cornered, and captured by local youths. However, the Enquirer called the turkey drop "sick," a "bizarre Arkansas celebration," and a "Festival of Death." These words, together with the photographs, produced such an outcry around the country that the Yellville Chamber of Commerce cancelled its sponsorship of the turkey drop in 1990. Had the Enquirer chosen instead to represent the turkey drop as a "charming" or "quaint" American tradition, it might still be going on. While the pictures in the Alabama Review are almost as appalling as the ones in the National Enquirer, the writers treat the Collinsville turkey trot and drop as a colorful American festival tradition. Turkeys trying desperately to balance themselves on telephone wires after being dropped head down from a scaffold are said to be performing "acrobatic stunts." The authors give no hint that there was anything wrong with treating the birds this way. References  Blosser, John, and James McCandlish. "It's Sick! Yellville Turkeys Tossed Out of Planes – For Fun." National Enquirer, Dec. 5, 1989. Purdom, Janie (President, Yellville Area Chamber of Commerce). Letter to Karen Davis, Oct. 29, 1996. "Dear Ms. Davis: Thank you for your recent letter concerning the Turkey Trot Festival. The Yellville Area Chamber of Commerce is the official sponsor of the National Wild Turkey Calling Contest and Turkey Trot Festival held in Yellville. The Chamber does not currently sponsor or sanction the dropping of live turkeys from airplanes and has not done so for a number of years." Kuykendall, James R., and Elizabeth S. Howard. "Turkey Trot Days at Oliver Hall's Store." Alabama Review 38.2, 1985: pp. 105-118.